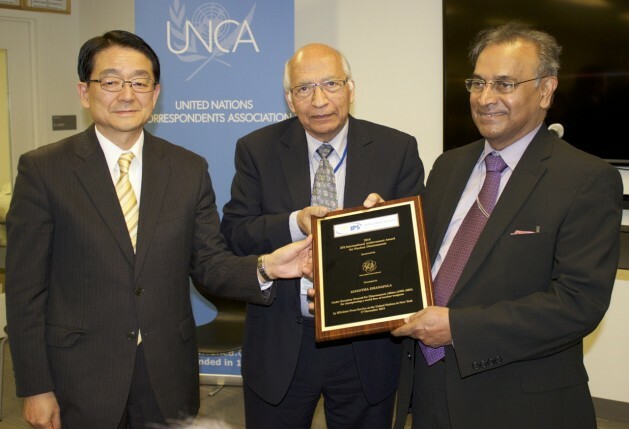 UNITED NATIONS, Nov 19 2014 (IPS) - Jayantha Dhanapala was awarded the IPS International Achievement Award for Nuclear Disarmament Monday at the United Nations in New York. Dhanapala, U.N. Under-Secretary-General for Disarmament Affairs until 2003, has remained committed to the goal of a nuclear weapons-free world since leaving his post, presiding since 2007 over the Nobel Prize-winning Pugwash Conferences on Science and World Affairs. "The award was created in 1985 with the idea to provide a link between the action of the UN at global level, and actors who would embody that action. It was not in the UN system in any way to recognize individuals, so we set up the IPS UN Award, as a way to help to bridge ideals and practice. IPS set up a very high level selection committee, who received candidates fromm all the IPS network, then spanning all over the world. The awardee was invited to New York, with his or her companion, and was greeted by the Secretary General, with whom he was able to explain his activities, and how those were part of the agenda of the UN. Then there was the ceremony, opened by the Undersecretary General for DPI, with the consign of the award, a crystal globe of the world. The ceremony was followed by a large reception, which become part of the UN life, and a yearly recurrent event. The award went from a protagonist of Perestroika to a leader in environment, to a woman engaged in breaking the glass ceiling, to an activist in human rights, to a leader of the black movement in the United States, to leaders of global civil society. It was a way to bring to the UN living embodiment of the plans of action which were drafted in the offices of the UN, and bring ideas and goals, in touch with reality. It is important to recall that until the Rio de Janeiro Conference on Environment and Development of 1992, relations with the civil society were minimal. Only the few organizations recognized by ECOSOC were allowed into the building. With the award, we organized a place for sharing between the civil servants and the activists engaged on the field. This relation did gradually expand, and today the best ally of the UN agenda are the hundred of thousand of NGOs and other organizations that engage in the world over global issues. IPS was their favorite source of information, because it was the only press agency that covered organically and analytically global themes, and therefore was their window to the UN. At a time in which we sorely miss a mechanism of governance of globalization, the function of IPS as a bridge between global civil society and the UN is even more important. The IPS award can be the symbol of that function, in recognizing the contribution to peace of Sokka Gakai, and its significantly large network all over the world." “The U.N. way is not to recognise individuals, so the award is a recognition of the bridge between ideals and practice.” The award has been resurrected after a six-year hiatus, and will be in place next year again. Additional awards in 2016 and 2017 will focus on the Sustainable Development Goals.